BALTIMORE (May 31, 2017) – Calling all Baltimoreans: you’re invited to B’More Greek! 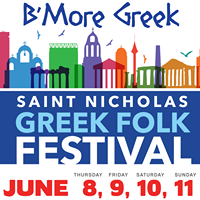 The St. Nicholas Greek Folk Festival, Maryland’s most attended Hellenic celebration, will once again take place in Baltimore’s GreekTown Square from Thursday, June 8 through Sunday, June 11, 2017. This annual four-day event celebrates the best of Greek culture: food, music, dance, faith and legendary hospitality. Attendees of the Greek Folk Festival will enjoy free admission and parking, food and drink vendors, arts and crafts, kids’ activities, and live music and performances. Guests also have the opportunity to participate in Greek dancing into the evening and under the stars in the outdoor pavilion, while taking in live Greek music from local bands – reminiscent of a celebration in Greece. All festival events will take place at GreekTown Square and Events Center, located at 701 S Ponca Street in Baltimore, and at St. Nicholas Greek Orthodox Church. Festival hours include: June 8 from noon to 10 p.m., June 9 from noon to 11 p.m., June 10 from noon to 11 p.m., and June 11 from noon to 10 p.m. All proceeds benefit the philanthropic efforts of the St. Nicholas Greek Orthodox Church. For more information, visit www.GreekFolkFestival.org.